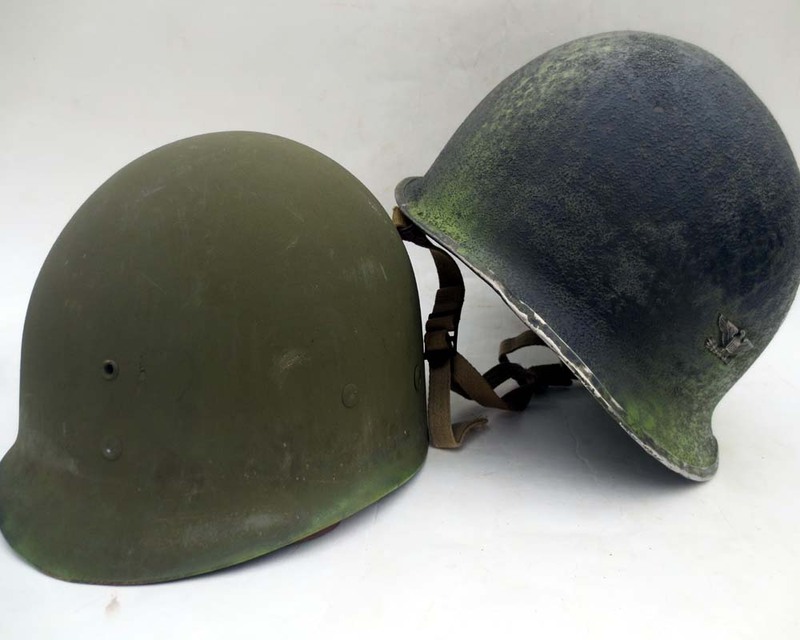 The helmet has been restored to look as if it had been worn by a Bird Colonel in the 517th Parachute regimental combat team. 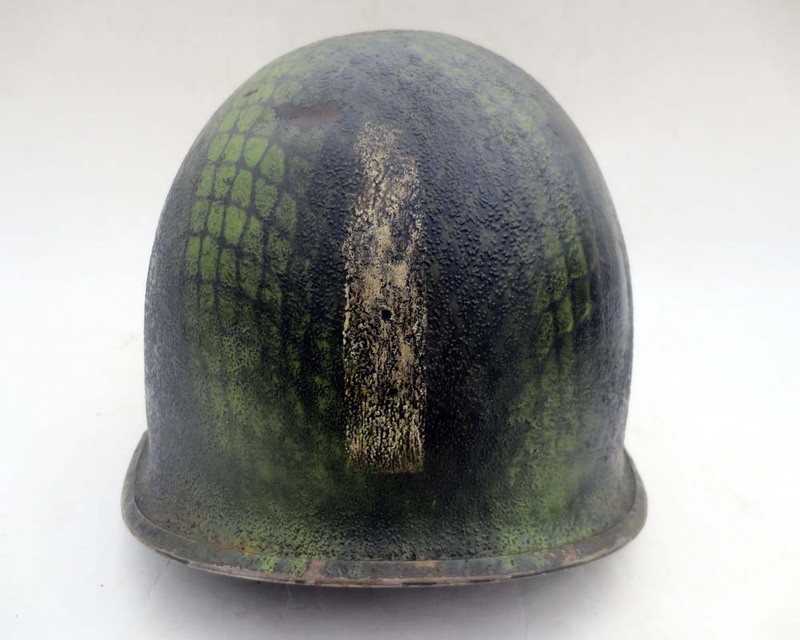 Helmet’s worn by the 517th PRCT are unique compared to M2s worn by other Para units. As the 517th prepared for Operation Dragoon it was discovered that their was a shortage of jump liners. To deal with this each helmet was rigger modified with split web chinstrap and buckles, were sewn directly to the helmet’s bails. Regular infantry liners were used, with no modifications. 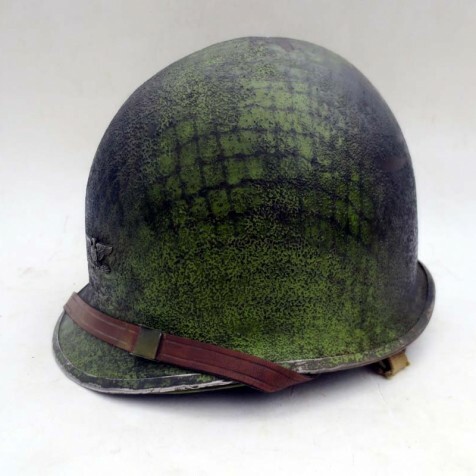 The helmet was totally stripped of all post-war paint then re-corked and repainted the correct shade of WWII flat olive drab. The Camo pattern used here is the official pattern used by the 517th during the operations in southern France. 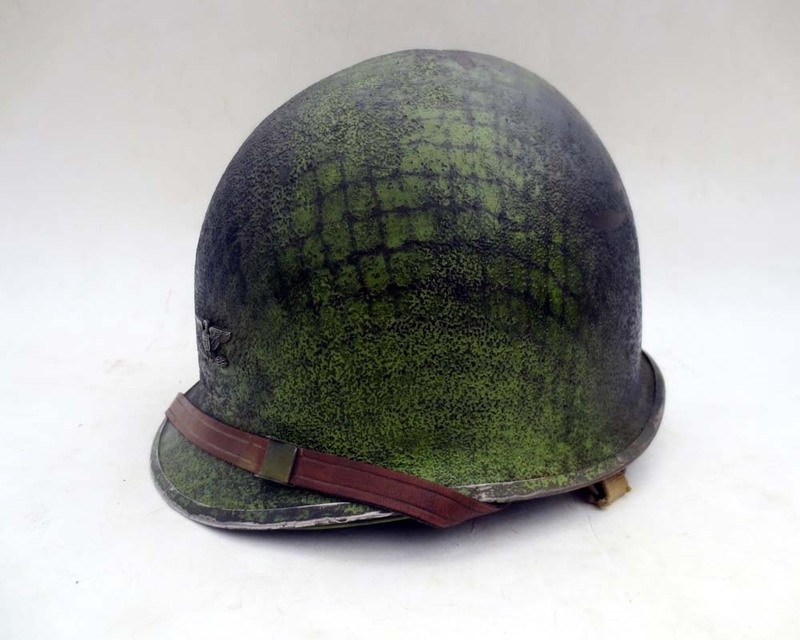 Prior to the jump helmets, uniforms and other equipment were over sprayed with a contrasting pattern of black and grass green paint. As was done here the helmets were first fit with a 1/4th inch mesh net then the paint was sprayed over the net creating the pattern seen here. This helmet has a bird colonel’s insignia attached to the front of the helmet and a hand rendered officer’s “follow me” on the back. The Colonel’s insignia is 70s, vintage but is the exact pattern used during WWII. The rigger chinstrap here is made new, aged webbing. It has been sewn to the helmet with light brown thread as most original examples were (the stitching was based on three original examples). 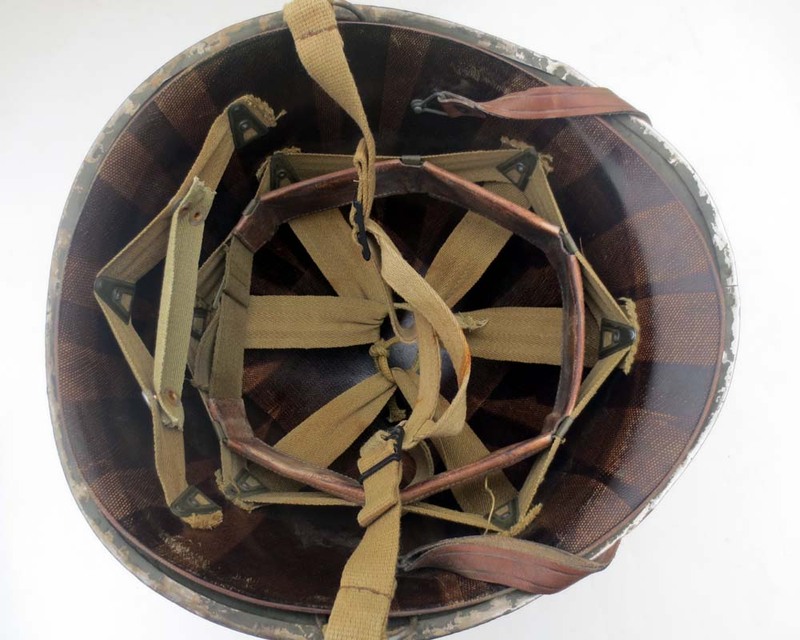 The mountain pack buckles are original U.S. WWII production. The helmet has been fit with an original Westinghouse liner. The liner has all original webbing and suspension. This is the mid-war version, with green steel A-washers and a resin chip textured O.D. #3 finish. The nape strap, chinstrap, and sweatband are new, but aged to match the helmet. The helmet has been aged to have the look and feel of an original. The cork finish has compressed from age and handling. The exposed steel has a deep plume patina.